On 16 March 1978, his friend from FUCI student days Aldo Moro, a Christian Democratic politician, was kidnapped by the Red Brigades, which kept the pope in suspense for 55 days. I have no mandate to speak to you, and I am not bound by any private interests in his regard. But I love him as a member of the great human family as a friend of student days and - by a very special title - as a brother in faith and as a son of the Church of Christ. I make an appeal that you will certainly not ignore;.. on my knees I beg you, free Aldo Moro, simply without conditions, not so much because of my humble and well-meaning intercession, but because he shares with you the common dignity of a brother in humanity.... Men of the Red Brigades, leave me, the interpreter of the voices of so many of our fellow citizens, the hope that in your heart feelings of humanity will triumph. In prayer and always loving you I await proof of that Paulus PP VI." Some in the Italian government accused the old pope for treating the Red Brigades too kindly. The Pope went on looking for ways to pay ransom for Moro but to no avail. On 9 May, the bullet riddled body of Aldo Moro was found in a car in Rome. Pope Paul VI left the Vatican to go to the Papal summer residence, Castel Gandolfo on 14 July 1978, visiting on the way the tomb of Cardinal Giuseppe Pizzardo who had introduced him to the Vatican half a century earlier. Although sick, he agreed to see the new Italian President Sandro Pertini for over two hours. In the evening he watched a Western on TV, getting happy only when he saw "horses, the most beautiful animals, that God had created." He had breathing problems and needed oxygen. Next day, Sunday the Feast of Transfiguration he was tired, but wanted to say the Angelus. He was not able or permitted to and stayed in bed, his temperature rising. From his bed he participated in Sunday Mass at 6 p.m. After communion, the pope suffered a massive myocardial infarction, after which he kept on fighting on for three hours. On 6 August 1978 at 9.41 p.m., Pope Paul VI died at Castel Gandolfo. 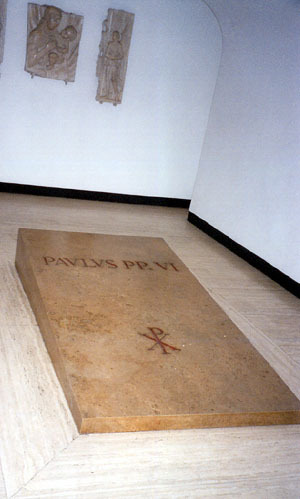 Paul VI is buried beneath the floor of Saint Peter's Basilica with the other popes. In his will, he requested to be buried in the "true earth" and therefore, he does not have an ornate sarcophagus but an in-ground grave. Pope Paul Vl, the pilgrim pope, died on August 6, 1978, the feast of the Transfiguration. He asked that his funeral be simple with no catafalque and no monument over his grave.